I bought a few Basil plants from a grocery store. 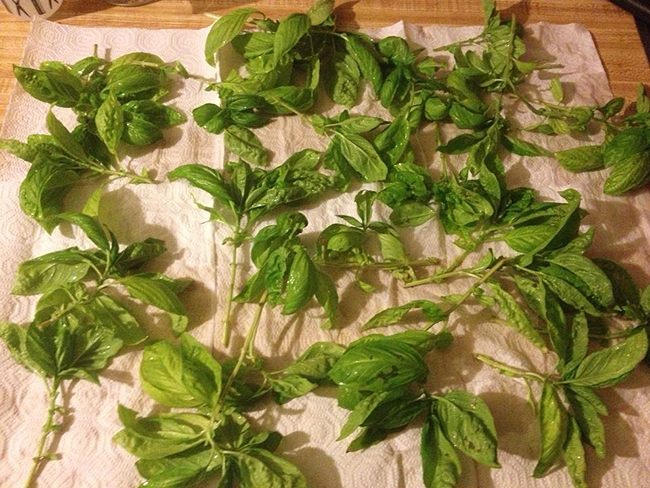 Who doesn't want fresh Basil when you're making your own pizza at home? I also thought that if I could grow enough of it, I could dry it and replace my dried, ground Basil that I love to use in other recipes. I kept the plants inside because it was summer, which in the desert means a dry, humidless 100°F or more. I thought it would die in a day if I shoved it outside. Within a week it turned black, shriveled and died. I thought it was diseased. I've never seen a plant turn black like that. I figured I bought a bad one. So, I bought another and the same thing happened. My third purchase was in frustration and eventually I put it outside, gave it a lot of water, and hoped for the best. It looked better the next day. So, I figured it just needed fresh air and more sun. Maybe there was something off in my house. I just bought the house after all. After a week, there were new leaves growing. After two weeks, it doubled in size. By the end of summer, I had a Basil bush! Now, I must add, I kept the Basil against the back of my house. My house faces South East. The sun crosses diagonally over the house from the front and set in the back. This Basil absorbed the afternoon/evening sun from about 12:30pm - around 6pm when the sun fell behind the mountain. Because of my experience with losing a few of the Basil plants before I realized what Basil needed, I was hesitant to pick from the plant. I now know that I should have been doing that all along. I also let it seed, which I shouldn't have done if I wanted it to keep producing leaves. Eventually, summer was over and I was at least satisfied with the results. I cut all of the stalks that had leaves on them worth keeping and soaked them in a sink full of water. I rinsed all of the leaves and did a little scrubbing with my fingers then laid them down on paper towels to dry. Patting them a little bit with paper towel helps. Avoid leaving them on the paper wet paper towels as that will keep them damp longer. I wrapped the stems with string, tied a knot and tied the string to a pegged shelf to dry. I ended up with four bundles. It took about 3 weeks. When I was done, my kitchen smelled amazing! I imagined I was walking into an apothecary shop or a spice store. This part is fun, but only if you have a mortar and pestle. I bought mine at Bed,Bath & Beyond (surprisingly) with one of those $5 or $10 off $30 coupons. I think it was only $28 and it was easy to find something else I wanted in the store. $20 something is the best you're going to get on a mortar and pestle over 4 wide. I searched for weeks online and in stores. I picked off the leaves and threw the stems away. I ground until a few were so small that they would turn to power if I kept grinding. So, I took the bowl in both hands and quickly spun it back and forth bringing the large pieces (that still were just too large) to the top so I could scoop them out with a spooon. I set the big pieces aside and poured the rest onto a piece of paper. I could them fold this paper and pour the ground herbs into a spice shaker and continued on with the grinding process. Again my kitchen smelled amazing when I was done. Having freshly ground herbs makes such a big difference. I'd buy the typical preground shakers in the store, but you have no idea how long they've already been sitting on the shelf at the store, let alone how long you had them on your own shelf at home. I can taste and smell the difference. You don't need to use as much to get the same affect. Although these ground herbs do go a long way, even if you use them frequently and generously. 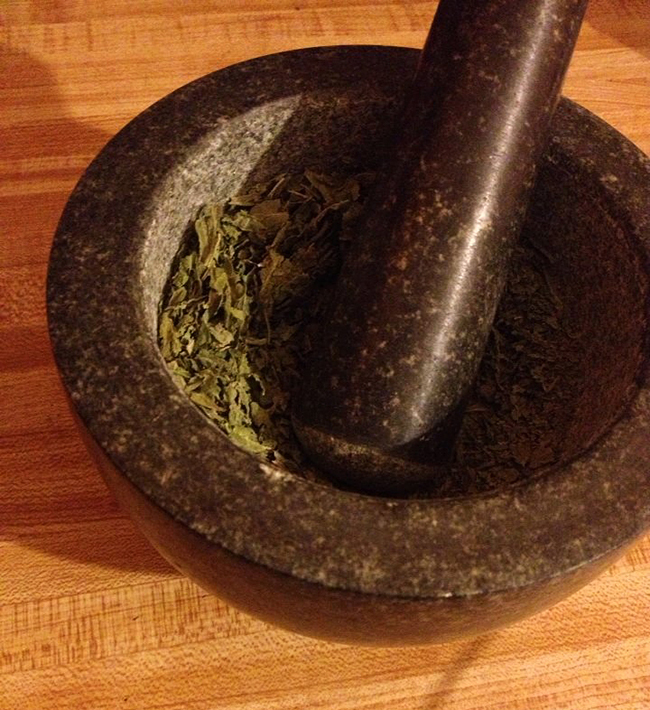 The Basil I dried and ground last year is still pretty fresh and the shaker is still half full. I'd use pita bread as a crust and make a mini pizza. I've done this many times and during these experiments I learned that putting chunky slices of carrot on the pizza is great for creating a topping that has a crunch. It's hard to get the crust crispy and crunchy without burning it or drying it out. Of course, I sprinkle a heavy amount of Basil on top before I put it in the oven. I love to spice up a spaghetti sauce. Store bought sauces are either too water or too salty. So, to fix this, I'll break down some fresh tomato in a skillet with onion, red pepper, a bit of frozen spinach and Basil, then use half of the sauce from the jar. Sometimes those premade pizzas at the grocery store go on clearance. That night it will go in the oven, but not without a few extra toppings. They tend to be pretty bland. So, I love to add basil and mushroom or artichoke. I wanted to reuse a little glass jar that had capers in it for storing my dried mint. After washing it, it still smelled like capers..and not just capers, but capers that have gone bad. Washing it with soap and water once was not enough. I scoured the internet and kept finding distilled white vinegar solutions, but it already smelled like vinegar. I know vinegar works wonders on many similar problems, but I wanted to try something else first. I ended up pouring some dishsoap and sea salt into it then filled it with hot water. I let it sit for a day. I put the lid back on it overnight, and the next morning....still stinky! I ran it through the dishwasher and used the steam sanitizer at the end of the last cycle. I let it sit for a day. I put the lid back on it overnight, and the next morning....still stinky! Fine, I'll try the vinegar and see what happens. When you have too many lemons, preserve them. I bought a house last year for its property size. Along with that perk were lots of fruit trees. There is a lemon tree that I thought looked very peasly. It was short and fat. The leaves looked a little sickly. I had no idea whether it would produce, so I made sure to keep it watered. My friend told me that I would be in luck, because right next to it was a lime tree. So, it could cross pollinate with another citrus tree. There were lots of bees buzzing around, and I was excited to see how many I would get! I was thinking about 6 lemons would grow on the tree. Six was the amount of the lime tree, but the lemon tree gave me 48! I couldn't believe my luck. Now what do I do with all of these? I can, of course, leave them on the tree until I need them. They'll continue to grow, but it was now November and there was a frost coming. I've never had a lemon tree before, and I was afraid I'd lose them all overnight like I knew I would with my zucchini, with the temperature below freezing. So, I picked them all! I gave a few away, used a few others for lemon, caper pasta, but mainly I wanted to preserve them. I got the idea from Joanne Weir's cooking show on PBS's Create channel (ya know, the channel you can watch without paying for cable). I looked up the instructions online and they were surprisingly simple. As you're packing the jar, press the lemons down so that the juice squeezes out. 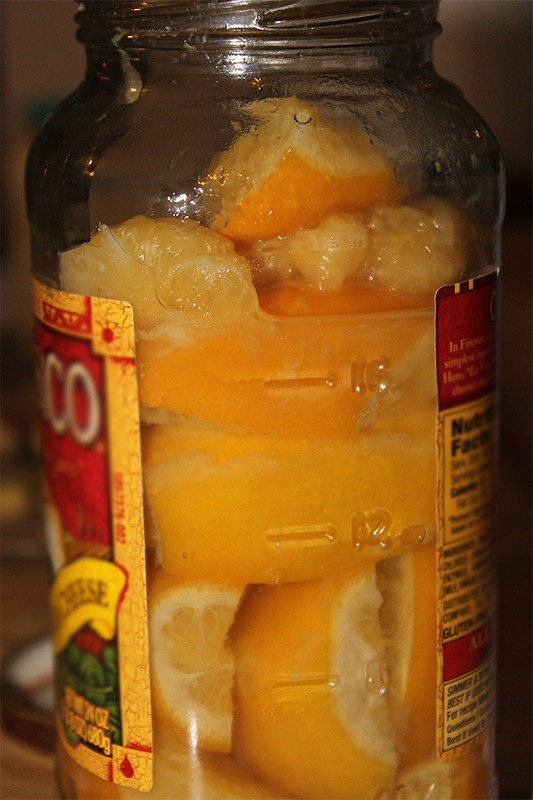 You want to have juice engulfing the lemons up to and over the top lemon of the jar. Pour a nice 1/2" layer of salt on the top, and close the jar. Now the rest I'm not positive about, but this is what I did. I placed them in the back of my dark cupboard for 2 weeks. I ended up with 5 jars, gave 3 away to friends, and four months later, the rind is so soft you can barely tell which part is rind and which part is flesh when you pull one out of the jar. I got to say they were organic since they came off of my tree, and I never sprayed it with anything. They might even be GMO, but I won't know unless I try to regrow the seeds. I just tried my first recipe about a week ago. My first dish with the preserved lemons was a success! 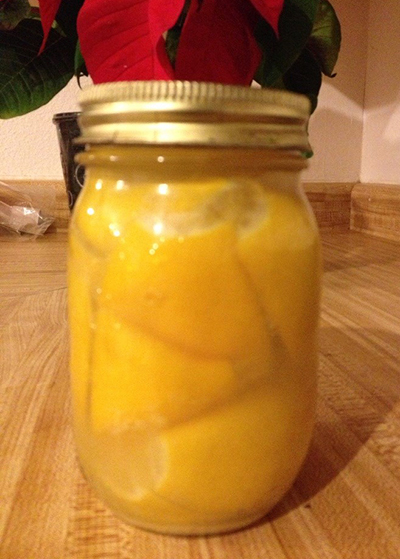 I had to Google preserved lemon recipes, because I had no idea what to do with them. Everything I found was some kind of Moroccan chicken recipe. I found a few with beef, but I didn't have any meat in the fridge so I kept searching and finally. I found a recipe with artichokes, and it called for a parsley pesto. So, I made an artichoke, parsley, preserved lemon stir fry to go over rice. I shared it with friends, and we ended up eating it on home fried tortilla chips like a dip. It was SO good that I had to make it a second time the next week. Afterall, I had lots of preserved lemon to use up. This time I tried to make the perfect rice which my friend explained to me how to not make it clumpy, and I added water chestnut and mushroom to the stir fry. I used too much oil, but it still turned out really well. I'll be able to better judge the oil next time. I'll post the recipe soon. Here's a better picture of the preserved lemons in a reused sauce jar. This is once I opened the jar and started using them after waiting for 4 months. I planted some broccoli seeds in March. Because of the shade from the nearby palm tree, the sprouts lasted through the harsh desert summer. They became viney, growing long and spreading through the shady area. I'm sure they were just struggling to stay alive. I know that it's a cool weather plant so I didn't expect much out of it until fall. As soon as the temperatures weaned off, the broccoli began shooting off those edible florets. They were pretty spindley. As any desert dweller knows, the fall season is very short. Only a few weeks passed before my garden was at risk of freezing temperatures. I picked the florets and ate them...delicious of course. After the 4 days of freezing temps, the bush began growing again. It was a bush at this point. It flowered immensely. Without doing proper research and lacking time, I just let it go. The yellow flowers were so abundant that the bees seemed to be drunk with excitement. I now know to cut these before this occurs. This was still exciting, and it's still alive!